The list is led by three feminist, environmentalist and anti-capitalist women. On May 26 we will elect representatives for the European Parliament and municipal authorities. In this sense, the CUP has launched the campaign Municipis Valents with an act in Cotxeres de Santa, where they presented the head of lists for the City Council. In the Municipality CUP-L’Hospitalet per la Ruptura has emerged, integrated by CUP de L’Hospitalet, Socialismo y Libertad, Constituents per la Ruptura and Nación Andaluza dels Països Catalans. The list is headed by three women, an expression of the feminist movement that crosses the world, contributing its renewing pugnacity. The candidate for the mayor´s office is Ariadna Velando (CUP), a teacher and activist in defence of the rights of the people with functional diversity. She is joined by Flor Salgueiro (SOL), worker and activist in anti-capitalist feminism and Mònika Tena (CUP), worker, feminist and neighborhood activist. 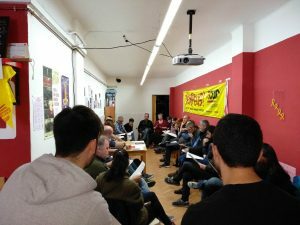 They are joined by social, labor, student, cultural and neighborhood activists, that have decided to take a step forward to impede institutional policies ending up in the hands of the old parties. A new tool for residents has arisen, with the illusion of creating popular counter-power. The programmatic axis are based on measures to confront misogynist violence, attain the protection and recognition of rights for work and family life, environmentalism, the fight for the independence and socialism. The confluence began in the mobilizations against the 155, for the self-determination, the freedom of the political prisoners, the demands of the feminist movement and the neighborhood struggles. The program, the ethic code, the logo, the slogans and candidates were agreed on in the last six months, with the democratic method of exchange of opinions and voting in assemblies of each Taula Constituent. The municipal elections will take place amid a deep polarization, crossed by the show trial in Madrid and the presidential elections that will take place on April 28. In this scenario, we cannot have proposals that are not radical. That is why, from the logo itself, the rupture can be seen. It is not a rupture with the neighbors, friends, working and honest people that consider themselves Spanish; knowing how to live with the differences is a great democratic value. It is the rupture with the 78 regime, with corrupt central governments, with the arbitrary and vengeful justice, with the repressive organisms, with the two-party system and the new false options, with patriarchy and capitalism. It is the rupture with those who have ruled for 36 years with the PSC in the City Council, who shaped a district at the service of the profits of big business over the needs of the people and a better quality of life. The great parties count with enormous amounts of money and a strong propaganda apparatus with which they confuse or influence a part of the people. It will be a hard struggle, but the last word has not been said. Is it not time to stop voting for the PSC of Nuria Marin? If you chose to, do not let the fake options trick you, like Ciudadanos, a recycled copy of the PP and ally of the VOX fascists. In the 2015 municipal elections, the CUP elected a councilmember, together we will do everything to gain representation again. From SOL we will put our forces at the service of a great campaign in the neighborhoods, workplaces and on the streets. You can help us. 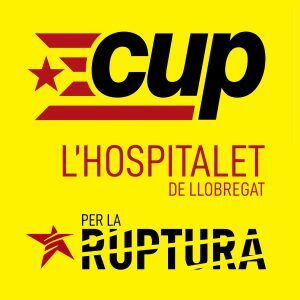 Learn the proposals of CUP-L’Hospitalet per la Ruptura, take materials to give to your friends, relatives and neighbors, go to the campaign sites and, if you wish, take part in our assemblies and open meetings.